During the Aldeburgh Regatta in September 1868, a display of fireworks took place near the Moot Hall. Apparently the Aldeburgh Artillery Corps Band were asked to play but refused and the Saxmundham Volunteers Band played instead! The British Legion Band played for the “Annual Pilgrimage of Witness” at Iken on Sunday 9 July 1939. 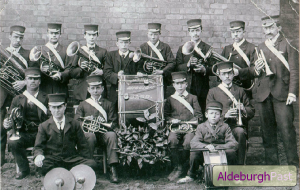 Aldeburgh Mission Band c. 1909. Photo courtesy of Alec Burwood. The Aldeburgh Past & Present website is currently being redeveloped to make it more mobile-friendly and easier to search. Please bear with us as new content is added. To visit our former website click here.